The @article template file is processed by PHP and will generate the content for each article that you are exporting. PHP is used to print the article title. If a meta title has been set then the meta title is used. The article title is added to the document. This is the title the user sees on the browser page. Article content is printed out using a function from helpers.php. Which PHP objects are available to the @article file? $userSettings: Settings the user has configured. $output_filename: The name of the file that the template output is being saved to. [title] => The title of the article. [title_websafe] => The websafe version of the article title. Safe for use in a URL. [description] => The article description. [description_plain] => The article description with no formatting applied. This only applies if text_format is set to xhtml. It will not be present when set to runs. [meta_description] => The meta description assigned to the article. [meta_search] => The meta search assigned to the article. [meta_title] => The meta title assigned to the article. [tag_list] => A comma delimited list of tags assigned to the article. [anchor_name] => The step anchor name. [instructions] => The step instructions. [instructions_plain] => The step instructions with no formatting applied. This only applies if text_format is set to xhtml. It will be be present when set to runs. [instructions_position] => 'above' or 'below'. [level] => 1 or 2. 2 means the step is a sub-step of the preceding step. This is useful if the HTML template article_structure property is set to 'flat'. [filename] => The full path to the step image. [relative_filename] => The relative path to the step image. [url] => If the template is being used to publish to a service like WordPress then this is the URL where the image is located. [width] => The width of the image in pixels. [height] => The height of the image in pixels. [filename] => The full path to the step thumbnail image. [relative_filename] => The relative path to the step thumbnail image. [type] => 'image' or 'html'. [html] => If 'type' is 'html' then this contains the HTML for the step. [media_alt] => The alternate tag for the media. [title] => The step title. [title_websafe] => The websafe version of the step title. Safe for use in a URL. [uuid] => The UUID of the step. 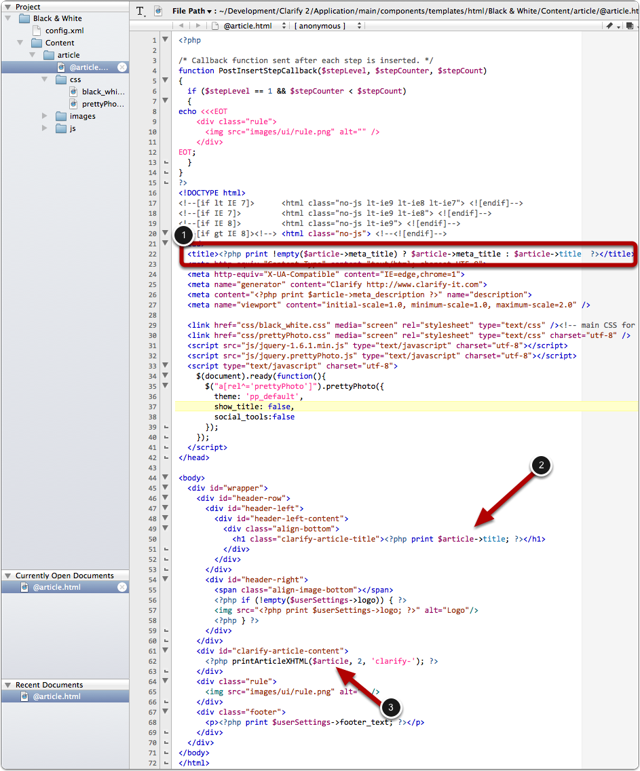 [substep] => Array: this is only present if the HTML template article_structure property is set to 'hierarchal' (default). [footer_text] => The text the use wants to display in the footer. [logo] => The path to the logo file the user selected.